Marie Spangler holds her wedding photo with her husband Roger at Meadows of Kalida on Tuesday. Marie & Roger Spangler’s wedding photo. 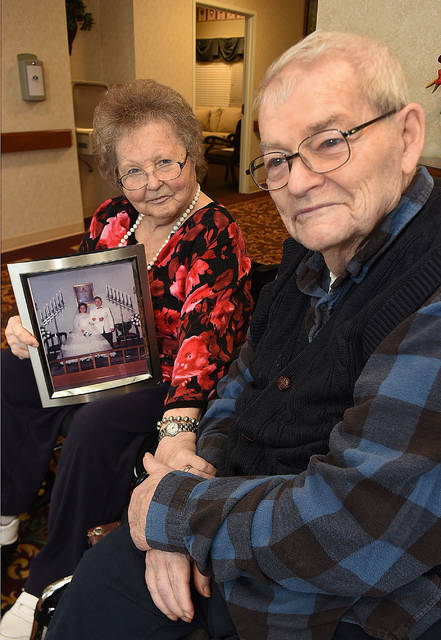 KALIDA — A tale in the true spirit of Valentine’s Day, the love story of Kalida residents Roger and Marie Spangler is nearly 58 years in the making. They couple will mark their 58 years of marriage on March 25 and said their faith, love and patience has held their marriage together all these years. The Spanglers will be residents of The Meadows of Kalida for three years as of this coming August. The Spanglers met when they were 14 and 15 years old at a church in Mandale, Ohio, through the youth group. Marie graduated from Continental High School and Roger graduated from Oakwood School in Paulding County. “I asked the preacher’s daughter who he was and she told me, and we had our first date at a tent meeting,” Marie said. Roger said he was immediately attracted to Marie. They officially started dating when they were in their 20s. “She was a nice person and I asked her out on a date,” Roger said. They visited each other’s parents’ homes and dated for about a month before Roger proposed. They were driving in Roger’s grandpa’s Ford truck when he asked Marie to marry him. There were 150 people at their wedding when they got married March 25, 1961, at Free Methodist Church in Keiferville, Ohio. “Our wedding colors were blue because that is my favorite color, and I had an orchid on top of the Bible I carried,” Marie said. 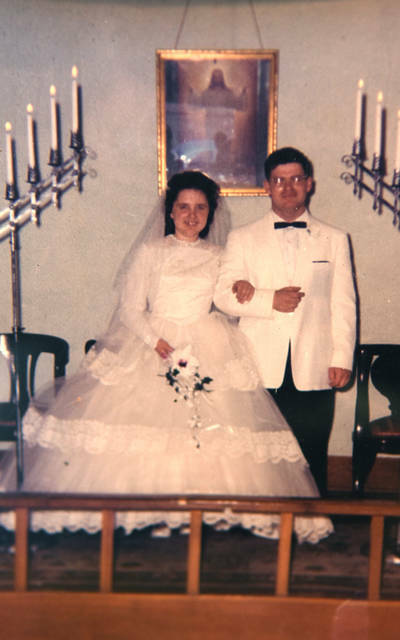 After the two were married, Roger worked in the factory and Marie went to college and after graduating taught 2nd grade for 27 and 1/2 years at Oakwood Elementary School in Oakwood, Ohio. They had three children — the first a daughter, and then two sons. “We loved being parents and were close as a family. They were active in the 4-H and showed cattle,” Marie said. They had a home in Paulding County on a farm and taught their children about caring for cows and how to grow corn, hay, wheat and beans. As a family, they vacationed to the Smoky Mountains. They were always a team when it came to raising their children. Retiring in 2002, they now have 10 grandchildren and 11 great-grandchildren. If they had a disagreement, they talked about it. Mary said it has been wonderful to have been married to Roger. She thanks God for bringing them together and giving them 58 years of marriage. Roger has dementia and he hugs Mary and tells her he loves her at the end of the day so she knows he knows it’s her. Mary said she loves Roger’s smile and disposition, and Roger said he loves Marie because she is a nice person and a good mom. The Spanglers read the Bible every day together and pray. Advice Mary said she would give to couples is to go to marriage counseling and talk through things when they get hard.